I received compensation for this post through my relationship with the Quality Blue Community. I also received a product for this review. All opinions are my own. Momma Told Me: I don't care what it looks like, eat it! I was a little spoiled growing up- Momma would make these extravagant lunches for me long before it was cool for 'modern' mothers to spend an afternoon whittling apples and molding rice. However, she did it out of love, and the need to fuel her creative side, rather than a need to convince me to eat a well rounded meal. I never had the luxury of deciding what I was and wasn't going to eat that is, if Momma put it on the plate (cut into stars, or straight from a can) I was to eat it without complaint. If course today's mothers not only desire to give their children a meal that is full of love, but also one that is more wholesome and nutritious. 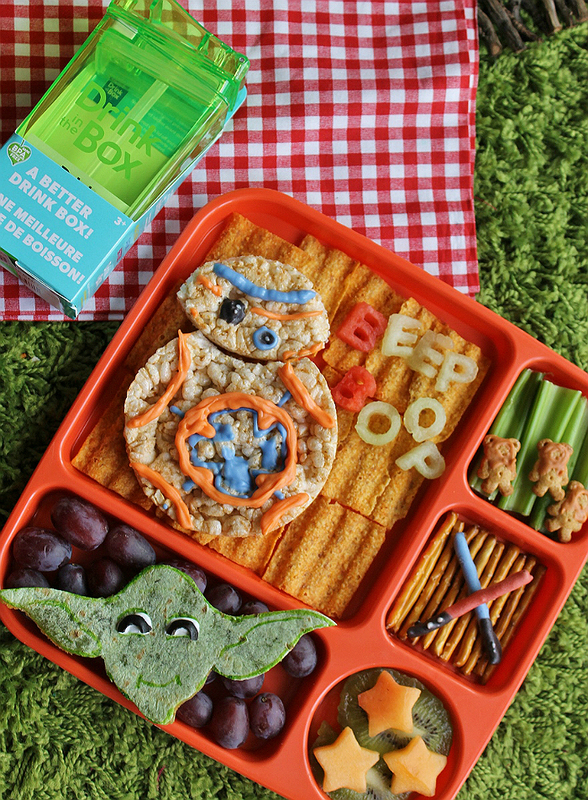 'Custom' meals are an integral part of modern parenting, and the accompanying beverage should not be overlooked! With the growing concern over high fructose corn syrup, artificial colors, and general additives in children's beverages, modern Mommas as checking labels and pouring from their own pitchers.As a child Momma never gave me straight fruit juice (even up to age 12, it was always cut with purified water.) But, of course, part of drinking from the 'juice box' (or pouch) is the 'cool' act associated with drinking from the vessel, not so much a concern for the drink inside. What if you could make your child's drinks just as cool, while getting them excited over drinking the beverages you choose? Drink In The Box, featuring Eastman Tritan™ nearly indestructible plastic offers a colorful, reusable, drinking vessel with all the cool angles of a modern drink box, minus the additives and extras. Learn more about Eastman Tritan™ and their products on their Facebook page. It couldn't be easier to get children excited about drinking healthier, refreshing, beverages. The Drink In A Box comes in 4 bright neon colors (Pink, Orange, Blue, and Green) so you'll never lose them in the car, purse, or travel bag- and they're entirely spill proof when closed, so you can bring your drinks on the go and sip all day long. This revolutionary snacking tool holds 8oz of your child's favorite beverage and can help cut out sugar dramatically when filled with fresh fruit and water, or even freshly squeezed homemade juice. 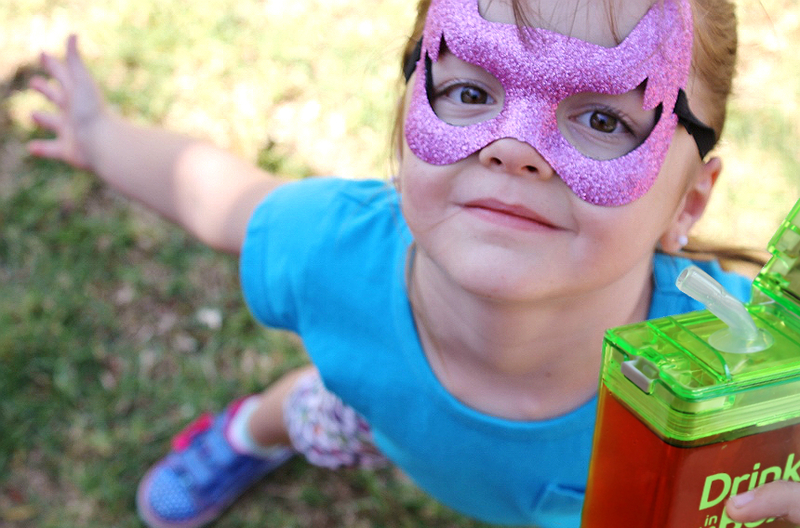 Did you know the average 8oz child's disposable juice box has around 14 grams of sugar? Yuck! Kid's are sweet enough already, no? And, of course it's made with durable BPA free plastics. It's no secret colorful plates and drinking containers, such as Drink In The Box made with Eastman Tritan™ plastic help get kids excited about eating healthier and eating more. It can be challenging to get children to step outside their comfort zone of 'accepted' foods and eat a more balanced meal so we like to prepare bento meals for the kids. 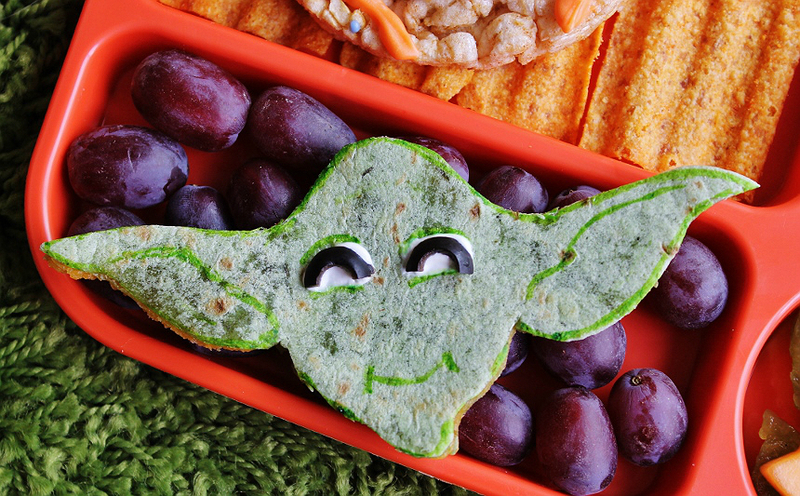 Using smaller portions of 'indulgent' snacks alongside healthier vegetables and fruits in fun cutouts and shapes a bento meal can keep picky eaters munching to the last bite. 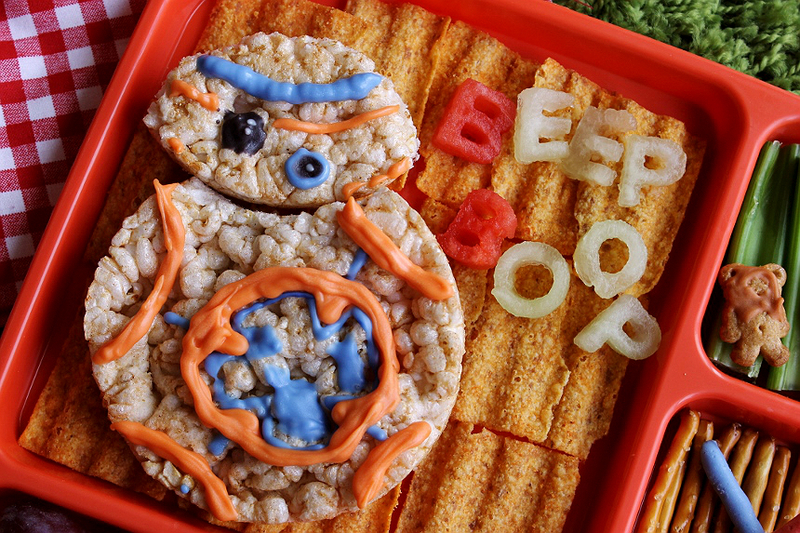 Right now we're pretty excited about a certain upcoming space character franchise releasing a 7th installment so we've been coming up with themed named for everyday snacks. I even put together the Bento you see below using rice cakes, a spinach tortilla quesadilla, some fruit punch outs, yogurt dipped pretzels and cinnamon bears. It's always fun to reconnect with a new generation about characters and stories from my own childhood- too bad Momma was never into 'that' series! Of course planning cute meals and cutting food into fun shapes is fun- but it also gets us thinking more about the food we put on our plates and in our mouths. Every time I reach for the Drink In The Box I remember that I have a choice to serve something loaded with sugar, or genuinely hydrating. We like to compromise and put frozen fruit in the bottom to help keep water chilled longer- and the children love eating the fruit at the bottom when they're done. Of course the Drink In The Box seals pretty darn tight, so they have to practice their 'please' and 'thank you's to achieve that! Whether you're trying to pack your little superheros in the car on the way to and from big brother's soccer practice, or simply helping to keep them fueled for another round of creative play in the backyard- smart serving choices make all the difference. You have a say what goes onto their plate, why not have a say as to what goes into their drink box? What do you like to fill your child's cup with? What Daughter Says: Have a say in what your child eats and drinks with healthier options in a cool disguise. Oh my gosh is this cute!! 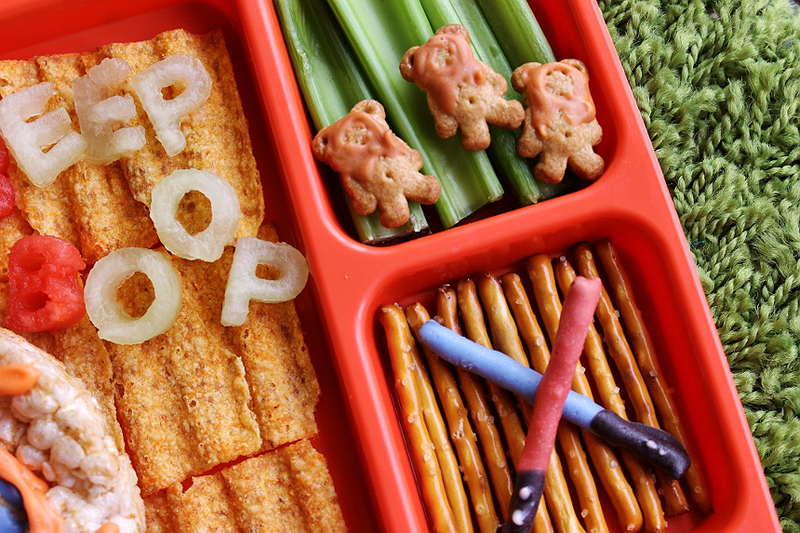 My kids would flip for a lunch like that! I have never been that creative, but could only hope to be! I love the Drink in The Box idea. So cute. 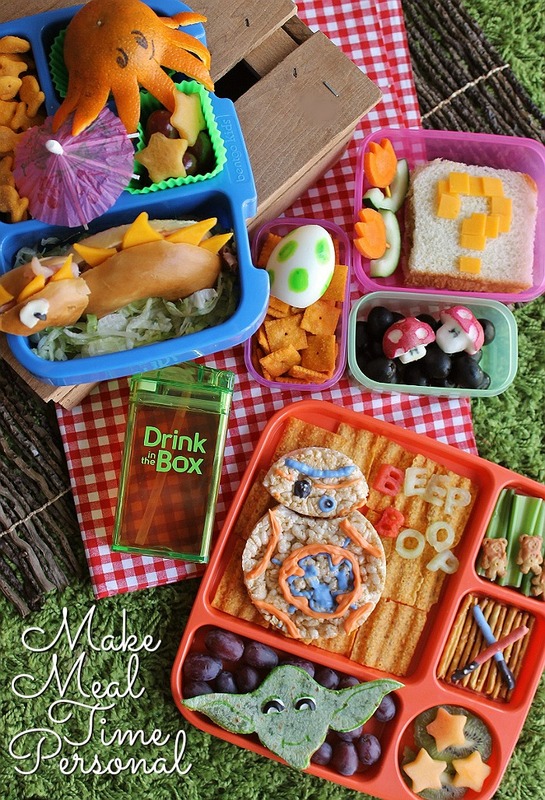 I also love the bento box ideas! First of all, will you make MY lunches from now on? Second, I'm loving that drink box! I was just thinking about my son's packaged drinks, and thinking how I'm not liking that I can't see what he's actually drinking. I prefer sending him with 100% juice, but had no way for him to carry it in his lunch box. Guess with this, that would be taken care of! 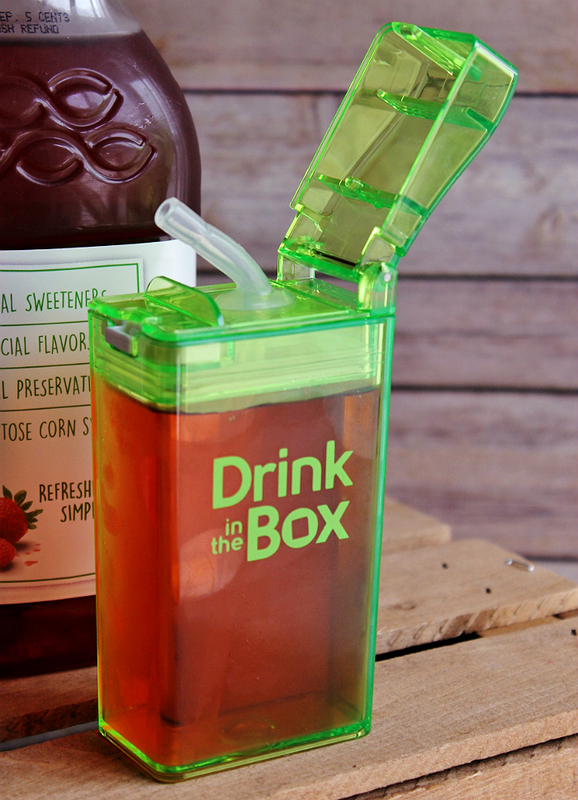 Drink in the box is such a clever idea. It makes perfect sense because kids love juice boxes. Why not choose what goes in them? Awesome! Wow so many amazing ideas for a fun lunch. I love that you can re-use that drink box. I AM ORDERING THESE FOR THE KIDS!!!! What an amazing idea- best stocking stuffer!!!! I love this drink box and my kids would too! I'm like your momma and I cut juice with water too! 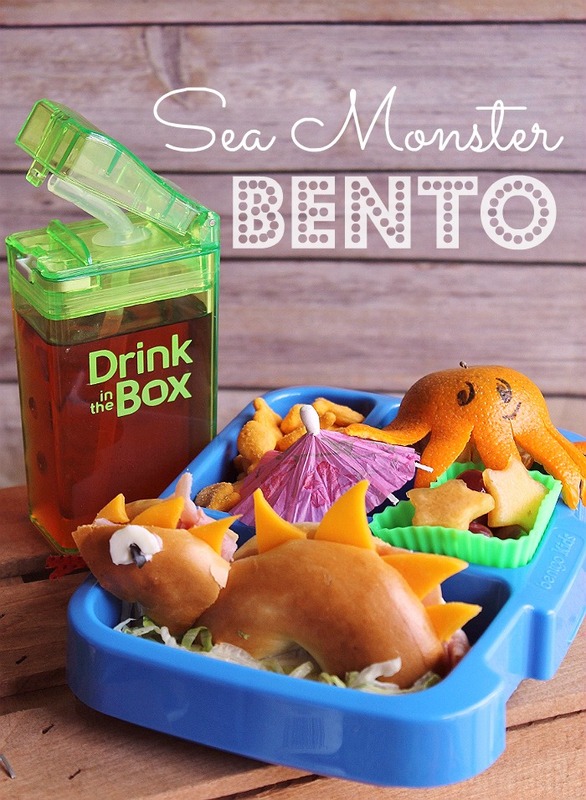 All your bento creations are so creative. I especially like the way you turned radishes into fairytale mushrooms. That juice box looks amazing too. OMGosh! How cute! I wish my kids were younger as I'd love to make them stuff like this. I love this Drink in a box more than I can say! No crap, just add my own choice for my nieces and nephews. I am going to order these for Christmas! They really are great- and the colors are so fun, kids just love the neon hues! Oh my goodness that box would save me so much money!!!! I buy organic juice at home and water it down but you can't find that in juice box so they get more sugar than I want and the boxes coast a fortune for 5 kids!!!!! 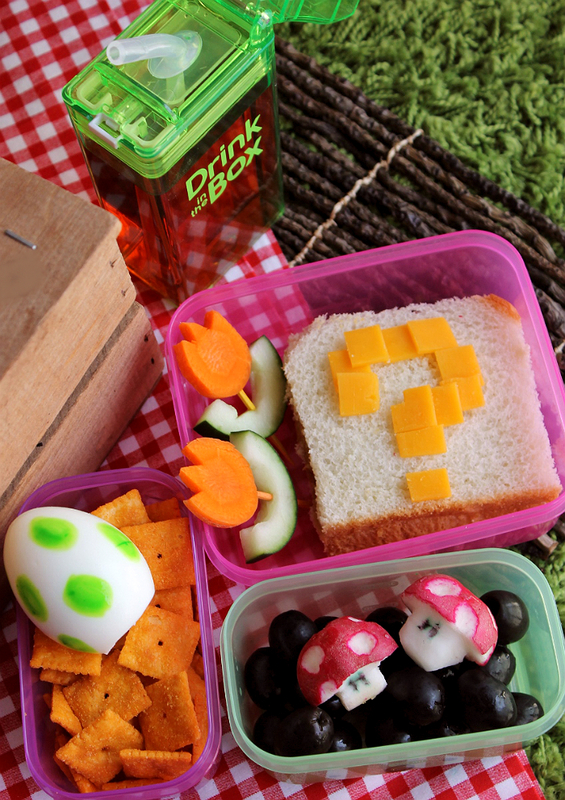 Your lunches are super cute too! Ok I just ordered 2 to try out with my youngest! Glad you ordered some- They are a really affordable option for mothers conscious of sugar content and/or organic ingredients. My nieces and nephews are happy with just fresh fruit in water- so much healthier and more affordable! This Drink in the Box is such a great idea! I spend extra money buying the little juice boxes PLUS extra money because I want 100% juice. Now I can buy the large bottles of the best juice and use these for lunches. Added it to my Amazon wish list!